The France international was close to joining Barcelona last season but decided to stay put at Atletico Madrid. 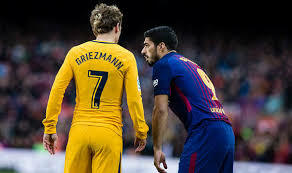 However, according to the latest reports, Griezmann is considering his future at the Madrid capital once again but France teammate Samuel Umtiti does not want him to leave so he doesn’t regret it later in his career. The was strongly linked with the Catalan club but would go on to announce he was committing himself to Atletico Madrid in a documentary entitled ‘The Decision’, signing a new deal until 2023. However, there have been reports that he feels he made a mistake with Atletico exiting the Champions League and once again struggling to keep pace with Barca in the title race. Umtiti who is currently on international duty with Griezmann where they are representing France believes the Atletico Madrid star has the qualities to play in any team in the world but does not believe he is looking for a move away from the Wanda Metropoliano. However, he advised his fellow world cup winner to think carefully before making any decision so he doesn’t regret the move later in his career. ‘I know Antoine is very happy in Madrid, it’s going well for him, it’s a team that plays for him, and after that, in a career there are choices that we can take and that we can regret,’ he explained to Telefoot. Both Griezmann and Umtiti started as France beat Moldova 4-1 in European Championship qualifying on Friday. Griezmann gave his side the lead with a volley while Umtiti was making his first appearance for Les Blues since September. Griezmann scored the opening goal as France beat Moldova 4-1 on Friday evening The France World Cup winner Samuel Umtiti also refuted rumours he is looking for a move away from the Camp Nou stating he is happy at Barcelona. The 25 year old has been linked to Manchester United and Manchester City this season. Reports emerged the French international is also looking for a move away with Barcelona preferring Clement Lenglet and Gerard Pique partnership in recent games. However, the former Lyon man who joined the La Liga champions in 2016 has debunked those rumours. When he was asked whether he felt disappointed to have knocked out his former side Lyon in the Champions League, he decided not to give a straight answer.